Welcome to Hinze Chiropractic & Acupuncture! Our Columbus chiropractor, Dr. Randy Hinze, heads a talented team of caregivers to serve your acupuncture and chiropractic needs. With more than three decades of Columbus acupuncture and chiropractic experience, Dr. Hinze is ready to help you find relief and lead a happier, healthier life. Our whole-body, all-natural approach to wellness allows us to find long-term solutions that restore balance and promote healing without adverse side effects or invasive techniques. If you need a chiropractor in Columbus, Nebraska, we're ready to help! Your musculoskeletal system is a complex network of bones and tissue, which support one another and absorb significant force throughout the day. 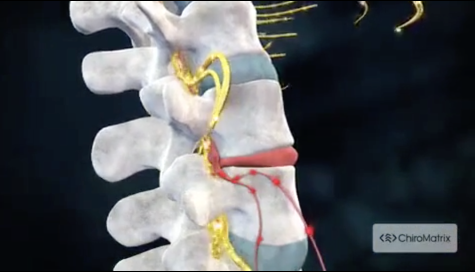 The spine supports this entire system, but your discs and tissue are vulnerable to injuries and slippage. If any damage or misalignment occurs, your body can no longer sustain the same force or support itself properly. Back pain, neck pain, leg pain, and even tingling or numb sensations are all signs that you may benefit from chiropractic care. Our Columbus chiropractic team uses a variety of all-natural techniques to restore proper alignment, reduce inflammation, and correct any sources of fluid buildup or tension. Acupuncture is an ancient healing technique that has withstood the test of time, and today it's an effective natural alternative to painkillers, anti-inflammatories, and other quick chemical fixes. If you suffer from tension, inflammation, or chronic pain, we may recommend acupuncture to harness your own body's healing abilities and rebalance your energy. During our Columbus acupuncture sessions, we use very tiny needles to stimulate certain pressure points in the body. You have 350 different sensitive pressure points, or acupoints, throughout your body, and acupuncture allows us to release built-up energy flow and relieve inflammation. Dr. Hinze specializes in general chiropractic care, pediatric and family care, and gentle techniques that promote healing. He is proud to work with two Chiropractic Assistants who are just as passionate about healing as he is, regularly attending new classes and keeping track of the latest techniques and advances in chiropractic care and wellness. Laurie has been Dr. Hinze's CA for 20 years, and she was named Chiropractic Assistant of the Year by a national organization. Monica helps serve our patients with her passion for chiropractic and is bilingual in Spanish, she is able to interpret for our patients during their visits to our office. We're currently accepting new patients at Hinze Chiropractic & Acupuncture, and we work with most insurance companies for your convenience. If you think you would benefit from our all-natural healing techniques, call us today to schedule your first appointment. Dr. Hinze and the rest of our team look forward to meeting you and helping you work toward lifelong wellness. Call us now at (402) 564-9447! Dr. Randy Hinze was born in Osceola, Nebraska. After graduating from York Public Schools he attended the University of Nebraska – Lincoln. "A year ago this week I could barely put my own socks on due to back pain, and came to see you guys. A year later, I have absolutely zero back pain, and I am 30 lbs lighter. Thank you to everyone at Hinze Chiropractic, I never believed my body would feel like this again. I haven't been able to say I have no back pain since I was 18 years old!"